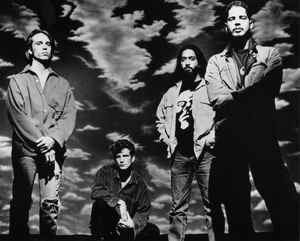 As one of the first bands to record for the legendary Sub Pop Records, Soundgarden is generally regarded as one of the founding fathers of grunge, even though most of their work was of a far more rock/metallic nature than the likes of Pearl Jam, Mudhoney, or Nirvana. From a metallic standpoint, their peak was 1991's Badmotorfinger, with the later albums showing a more alternative side to the band (and also produced their biggest hit single, "Black Hole Sun"). The band parted ways amicably in April of 1997 to pursue other interests. Most notable of these was vocalist Chris Cornell joining forces with the core of Rage Against The Machine in Audioslave. At precisely midnight on January 1, 2010, U.S. EST, Chris Cornell posted on his Twitter and Facebook: "The 12 year break is over & school is back in session. Knights of the Soundtable ride again!" On May 18, 2017, around midnight, vocalist Chris Cornell was found dead in MGM Grand hotel room after a show in Detroit. I had been enjoying something of a Soundgarden revival in the last couple of months, with Ultramega OK and Louder Than Love on high rotation. I feel they had more great music in them and Cornell was always something of a hero since I started getting into music 20 something years ago. So sad to lose arguably the most talented musician of his generation. Interesting that this band's page finally get comments after Chris dies. However, it's still good to see appreciation for the most metallic-sounding band from the Grunge era. While other grunge mates like Nirvana, Alice in Chains, and Pearl Jam captured angst better, Soundgarden sounded much more powerful, even when going outside the standard grunge conventions like odd time signatures or even trekking through psychedelic sounds in Superunknown. It's an utter shame that I'll never seen 'em live. You want to have some fun while listening to a true art punk metal masterpiece? Listen to Louder Than Love. Turn It Up for Chris. KEXP is playing Chris Cornell all day long. They are playing a cover of "In My Time of Dying" with Soundgarden. The best cover of that song ever! Does anyone know where can I find a copy of this?!! !